As a tech writer, I have a bias towards programs that make it easier for me to communicate graphically, especially when a step-by-step process is involved. 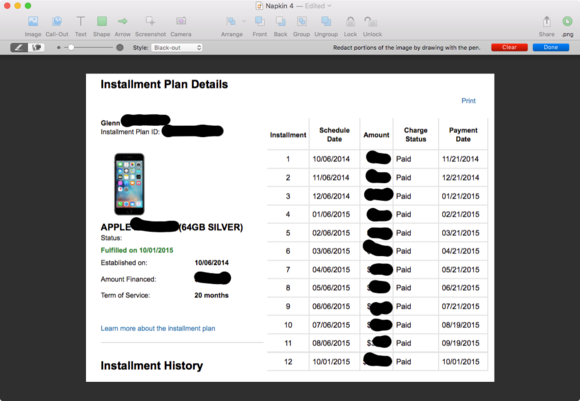 Napkin 1.5 helps enormously by letting me take an image—whether a photo or screen capture—and quickly annotate it in a way that looks professional and can be edited later. This is a niche product that, for the right person or company, will save inordinate amounts of time, and it requires only a few minutes to master. That compares favorably to using, say, Pages or Keynote and exporting the results in a fashion you can use. Napkin’s interface is intentionally limited and simplified. There are few tools and little elaboration. But simplicity is a benefit when the right choices are made. Napkin revolves primarily around images, which can be used directly and cropped. A very clever Call-Out tool lets you put a magnifying glass over an area of an image to enhance detail, including automatically adding portions the app recognizes as faces. (Facial recognition isn’t perfect by any means.) Images can be dragged in or imported, and there’s also Screenshot and Camera tools for creating new ones. To annotate, you can use text, shapes, or lines. The Call-Out feature’s lowest magnification settings can be too high in some cases. Lines have a fair amount of nicely tucked-away complexity. Once you place an endpoint over an image, shape, or text box, whenever you move that object, the endpoint moves with it. I do think the default arrow shape is a little horsey, as it offers only a single head style and tapers in an abrupt way from thick to thin. You can resize a set of objects to have the same widths or heights, useful when drawing freeform and then tightening things up. As an example of a useful purpose to which to put Napkin: our home-entertainment system is the same mess that all such systems are, and my wife asked me to document how different functions work. This is useful, because I often forget the precise sequence and need to re-teach myself. 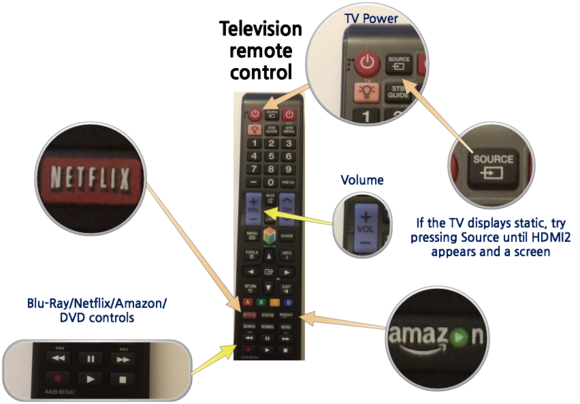 I took pictures of the various remote controls, brought them into Napkin in separate documents, and then used callouts to zoom in on elements like the dedicated Netflix and Amazon buttons. I used arrows to connect the callout to the point on the original image—a feature that would be great to automate in a future version, since it’s an obvious connection. Then I used text to label the parts. 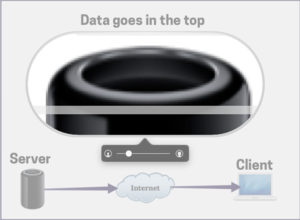 You can create complicated diagrams with callouts and arrows with great ease in Napkin. When you’re done working on an image, you can drag the “.png” icon in the upper right of the window to another app or onto the Desktop, and a PNG of just the active image area—defined by the outer edges of any objects—gets made and exported. You can also use Share to access sharing services, or File > Export to turn into a JPEG, JPEG-2000, OpenEXR, PDF, PNG, or TIFF, and choose the location. Despite its simplicity, there’s plenty of depth as you learn to use it. Because screen captures or other images often contain private information when you’re making something to share with others, you can use a built-in redaction tool. Hover over an image and click the gear icon to select it or simply double-click the image. Redaction lets you black out, pixelate, or blur parts ofan image, but as a layer you can revise later. An image’s pop-up menu lets you use primitive facial-recognition to call out or redact all faces Napkin identifies. A slightly hidden option lets you redact all faces recognized in an image with a single selection: when viewing in an image in the regular layout mode, click the gear icon, and choose Redact Faces in Image. Like more powerful drawing and layout programs, every element is placed in an invisible stack in relation to every other element, so you can use the typical send backward/send to back and bring forward/bring to front options, as well as arrange, distribute, and lock objects. A few rough edges prevent Napkin from reaching perfection. The Call-Out tool has a minimum magnification size that’s way too large in many cases as it’s relative to an image’s full resolution, rather than how it’s resized in a Napkin document. It should be adjusted to be relative to proportion. Duplicating an object should be an Option-drag away, as in most drawing and layout program, but one must use Command-D (Edit > Duplicate), which produces a copy that’s offset, meaning it has to be moved if you want to have text or objects have common alignment. Also in the interests of fewer features makes better work, you can’t set both the fill and outline (stroke) for a shape. I understand why the developers limited that, but it seems like a small thing to change to allow better variation in making boxes. You also can’t drag to select objects; instead, you must hold down the Shift key and draw around the perimeter of everything you want to include. These are all minor concerns, but I hope the app continues to develop and mature without giving up its simplicity. At $40, Napkin isn’t an impulse buy for most people. However, if you’re constantly making these sorts of images for family members, colleagues, presentations, or publication, you can speed up your process and likely produce nearly effortlessly better results with this gem.